Peerless-AV introduced its new indoor Portrait Kiosk for displays ranging from 40"-55". Featuring an aesthetically pleasing curved design, the new Portrait Kiosk offers a range of functions, such as wayfinding, entertainment and digital merchandising, for any indoor application setting – from corporate to retail to hospitality, and beyond. 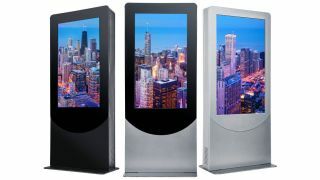 The newest addition to Peerless-AV’s line of kiosk solutions, the floor standing, indoor Portrait Kiosk supports the latest displays and touchscreen panels from the industry’s leading manufacturers. The new Portrait Kiosk is available as a standard solution for Peerless-AV’s customers. Enhanced options that can be added to the kiosk include stereo speakers and amplifiers, hi-definition web cameras, bar code scanners, credit card readers, Wi-Fi or cellular connectivity with an external antenna, proximity sensors, and thermal receipt printers. For applications where branding compliance is required, further custom options include bespoke color finishes, vinyl logos, and wraps. Peerless-AV’s line of new indoor Portrait Kiosk is available through Peerless-AV direct sales representatives and authorized distribution network.